In Marathi the naming ceremony is Baarsa. The family invites relatives, guests and the blessings of the elders are sought by everyone on the occasion. A colourful cradle is made in which the child is placed with new clothes and the womenfolk sing a chorus around the baby seeking divine’s help to usher in happiness and good health to the newborn. Depending upon the traditions of each sub-caste, the families hold the baby naming ceremony either on the twelfth day or after forty days. 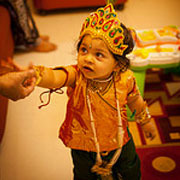 In some Hindu families, rituals and ceremonies are observed even before the baby naming ceremony. Some of them are conducted during the fifth or sixth day of the birth of the newborn baby. It is known as 'Panchvi' or 'Chhathi'. Such ceremonies are performed to protect the newborn from evil spirits. Families take adequate care and attach importance to name their newborns and Marathi couples are no different. While education and social background influence the naming ceremony in Marathi families, like rest of the country here too tradition and long-held practices are followed on the occasion. Generally names are drawn from Hindu mythology like Mahabharata, Ramayana and Marathi folklore where are plenty of characters that may fit the bill. 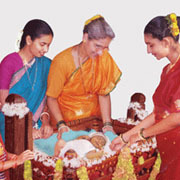 The elders of the family is consulted along with the astrologer while choosing the name of newborn. The aunt of the baby (father's sister) whispers the name in the baby's ears and then the name is announced to everybody on the occasion. Women sing the songs for welcoming the newborn baby and performing the baby naming ceremony. Each and every family member takes pleasure to rock the cradle of the newborn baby during the naming ceremony. A range of jewels and fine clothes are presented to the child by the elders and invitees at the ceremony followed by a sumptuous feast.